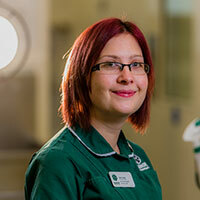 I joined Manor Vets in 2008 as a final year student nurse after completing a degree in Veterinary Nursing Science at Hartpury College in Gloucestershire and working in several other practices along the way. I qualified as an RVN in early 2009 and have worked my way up through the ranks to the position of Head Nurse here at Manor. I am a qualified clinical coach and have experience teaching students both in practice and in a college setting. Teaching the new generation of veterinary nurses is something I feel very passionate about. I have recently completed an ILM course in leadership and management. My areas of interest include nutrition and radiography. I have three cats at home, Badger (with brain damage), Mushroom (with no teeth) and Geoff (who was hand reared by the team). In my spare time (there’s not much of that!) I love baking and spending time with my five-year-old son Samuel.